The 2018 Volkswagen Tiguan truly has a design of its own. A bold character line runs from front to back, conveying chiseled strength, while hood contours deliver a momorable statement up front. The completely re-designed exterior is longer, wider and more dynamic from top to bottom. The interior has also been completely re-designed, providing more legroom and new color choices. Sharp modern styling creates an interior that you'll never want to leave. But, new comfort features doesn't necessarily mean dull. 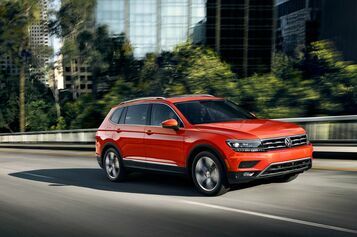 The 2018 Tiguan is smooth and responsive on paved roads and remains commanding and confident even if the road surfaces become more challenging. It’s longer, wider, and more dynamic from top to bottom. Bold styling is everywhere, from the powerful look to the sculpted hood. 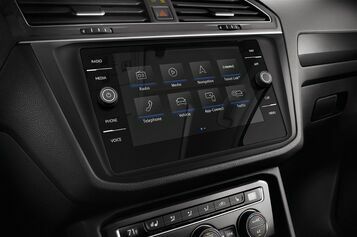 1 Starting MSRP of $25,345 for a 2018 Volkswagen Tiguan S with 8-speed automatic transmission. Price excludes transportation, taxes, title, other options and dealer charges. Dealer sets actual price. 2 22 city/27 highway mpg (2018 Tiguan 2.0L, 8-speed automatic transmission). EPA estimates. Your mileage will vary and depends on several factors, including your driving habits and vehicle condition.